On July 20, 1969, Neil Armstrong and Edwin Aldrin became the first human beings to walk on a world that was not their own. It was Grumman Lunar Module LM-5 "Eagle" that got them there. In all, six LM's successfully landed 12 men on the Moon between 1969 and 1972. The LM was a two-stage vehicle, Ascent and Descent, and both stages were covered with gold, silver and black thermal shielding which gave the spacecraft a fragile appearance. The LM was the first true spacecraft, performing it's mission only in the vacuum of space, thus no aerodynamic qualities were needed. It was also built of extremely light thin metal, as the heavier it was the more fuel it would have to burn while looking for a safe landing spot. 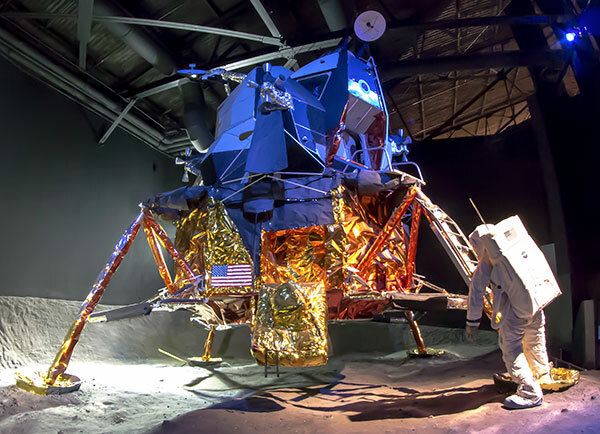 This original Lunar Module, LM-13, was intended for the Apollo 18 mission to Copernicus Crater in 1973, which was ultimately cancelled.